Fig. 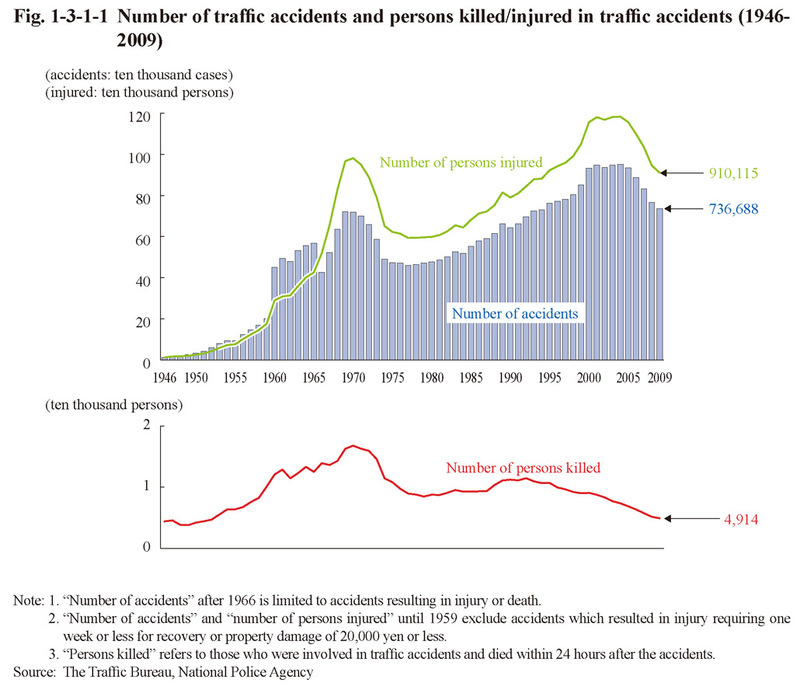 1-3-1-1 shows the number of traffic accidents and the number of persons killed or injured in those accidents since 1946 (See Appendix 1-5 for details). 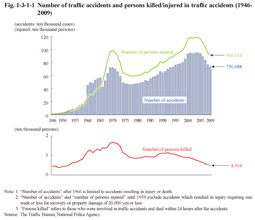 The number of traffic accidents and the number of persons injured in traffic accidents both remained at a high level between 2000 and 2004, but then started to decrease for five consecutive years on and after 2005. The number of persons killed has been on a decreasing trend since 1993 and was 4,914 (down 4.7% from the previous year) in 2009, falling below 5,000 for the first time in 57 years since 1952. (2) Dangerous driving causing death or injury and negligence in vehicle driving causing death or injury, etc. The number of persons cleared for dangerous driving causing death or injury in 2009 was 317 (down 8.9% from the previous year) and that for negligence in vehicle driving causing death or injury, etc. 718,633 (down 3.1% (id.)) (See Table 1-1-1-2). 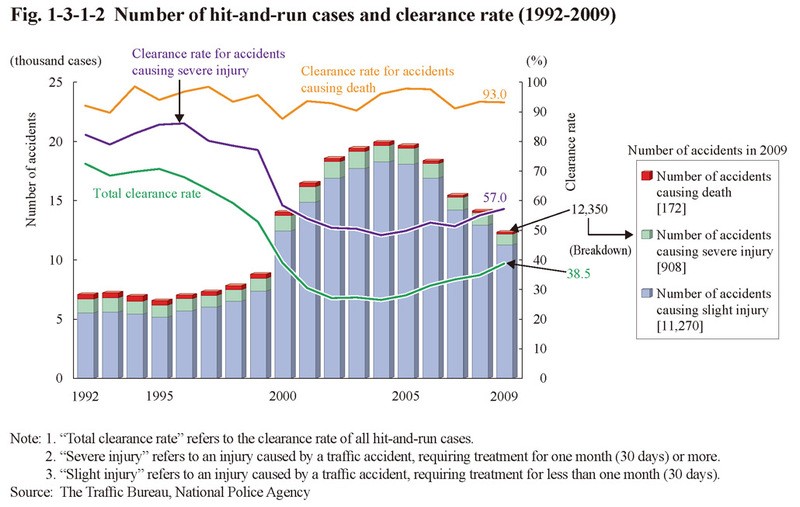 Of these the number of persons cleared in cases involving death was 27 (down 22.9% (id.)) for dangerous driving causing death, 4,227 (down 7.1% (id.)) for negligence in vehicle driving causing death and negligence in the pursuit of social activities causing death, and 23 (down 30.3% (id.)) for causing death through negligence (including causing death through gross negligence) (Source: The Traffic Bureau, National Police Agency). Fig. 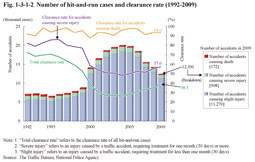 1-3-1-2 shows the number of hit-and-run cases (cases of breach of the duty to provide first-aid pertaining to road traffic accidents, thus resulting in death or injury) and the clearance rate since 1992. The number of cases increased sharply from 2000 on, but then started to decrease for five consecutive years on and after 2005, and was 12,350 (down 1,807 or 12.8% from the previous year) in 2009. The clearance rate had been on a declining trend since 1996, but then on a slightly rising trend on and after 2005. Limiting the cases to those involving death revealed that the clearance rate generally remained at the high level of more than 90%. 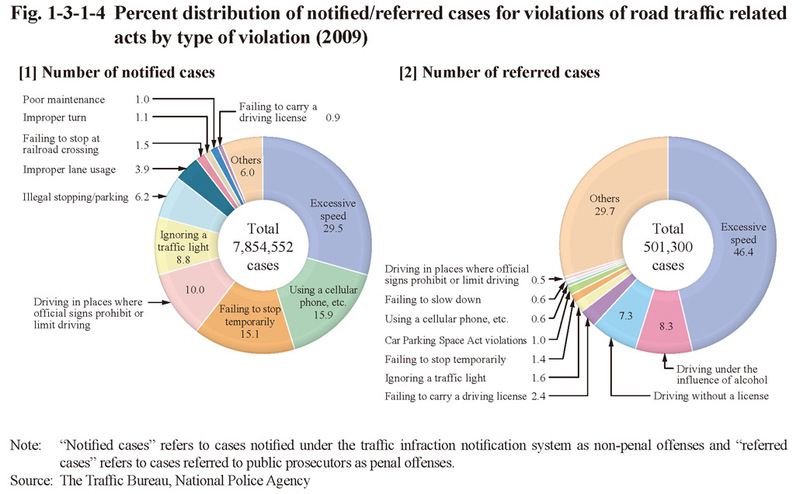 The number of processed cases of violations of road traffic related acts, which is the sum of the number of notified cases that fell under the traffic infraction notification system as non-penal offenses (hereinafter referred to as “notified cases” in this subsection) and the number of cases referred to public prosecutors directly as penal offenses (hereinafter referred to as “referred cases” in this subsection), has remained within the range of eight to nine million since 2003 and was 8,355,852 (up 2.1% from the previous year) in 2009 (Source: The Traffic Bureau, National Police Agency). The number of notified cases hit a minimum of 6,867,396 in 2001 but then continued to increase. It reached 8,165,633 in 2005, but was then slightly decreasing, and was 7,854,552 (up 2.5 from the previous year) in 2009 (Source: The Traffic Bureau, National Police Agency). Fig. 1-3-1-3 shows the number of referred cases over the last 20 years. The number reached 1,172,677 in 1992, and then remained stable. It started decreasing sharply from 2000 on and was 501,300 in 2009. By type of violation both driving under the influence of alcohol and excessive speed have been remarkably decreasing since 2000 and 2002, respectively, while driving without a license has also been slightly decreasing. Use of an index with the number for 1990 set as 100 revealed that the index for driving under the influence of alcohol was 12.7, that of excessive speed 48.4, and that of driving without a license 24.5 (See Section 3, Chapter 2 and Section 1, Part3 of Part 2). Fig. 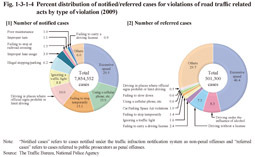 1-3-1-4 shows the percent distribution of notified/referred cases for violations of road traffic related acts by type of violation in 2009. Of notified cases excessive speed was the highest in proportion at approximately 30%. Of referred cases excessive speed was also the highest in proportion at nearly 50%, followed by driving under the influence of alcohol, and then driving without a license, with the three types of violations accounting for 62.0% of all referred cases.